These are really yummy. I carry them for a quick snack. 1. Prepare for Baking: Heat the oven to 325°F with a rack in the middle of the oven. Line the baking pan with parchment, leaving extra parchment to hang over the sides. Lightly coat with nonstick cooking spray or butter. If desired, toast the nuts and grains for 10-15 minutes until toasted and fragrant. For softer dried fruit pieces, soak the dried fruit in very hot water for 10 minutes and drain before using. 2. Mix the Dry Ingredients: Mix the oats, cereal, nuts, and dried fruit together in a mixing bowl. 3. Warm the Rice Syrup: Warm the rice syrup for 10-15 seconds in the microwave or in a small saucepan over medium heat. It should be just loose and liquidy enough to pour. Mix in the vanilla extract, salt, spices (if using), and peanut butter or cocoa powder (if using). 4. Stir the Rice Syrup into the Dry Ingredients: Pour the rice syrup over the dry ingredients. Use a spatula to scrape the last of the syrup. Stir the rice syrup into the dry ingredients until the ingredients are completely coated and start to stick together in clumps. 5. Press into the Pan: Pour the mixture into the prepared pan. Use wet or lightly oiled hands to firmly press the mixture into the pan. 7. 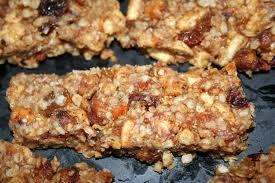 Cool the Granola Bars: Let the bars cool completely in the pan. They will firm up as they cool. Once cooled, cut into 8 bars in the pan with a very sharp knife, then lift the bars by the flaps of parchment to remove from the pan. Store between layers of wax paper in an airtight container for up to two weeks. To make them easier to slip into back packs and lunch boxes, you can also wrap each bar individually in wax paper or plastic wrap.